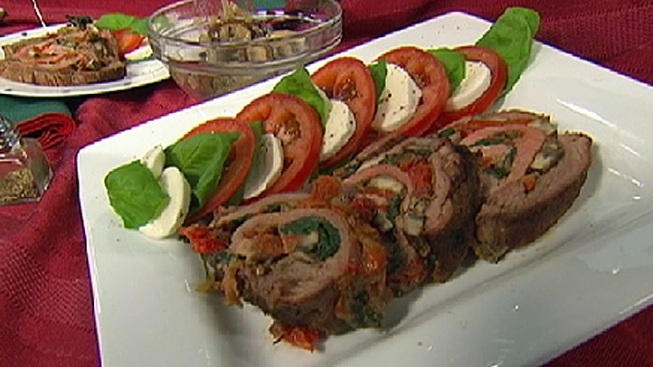 Grill a tender flank steak stuffed with mushrooms, spinach and roasted red peppers. Over the last few segments I’ve shared outdoor dining tips and recipes for drinks, appetizers and first course dishes. This week features the main course with a flank steak seasoned in my grilling spices and stuffed with spinach, mushrooms, roasted red peppers and parmesan cheese. Seared and roasted on the grill, this hearty dish is definitely a crowd pleaser. Also, once you’re created this version, try experimenting with other stuffing ingredients to truly make it your own dish. Put whole red peppers in a heat proof pan or foil lined baking sheet and place under the broiler close to the heat. Allow the peppers to blacken on one side and then rotate until the peppers are blackened on all sides. Remove from broiler and allow to cool. Once cooled, rub off the blacked skin, remove stem and seeds and chop the peppers. Set aside. 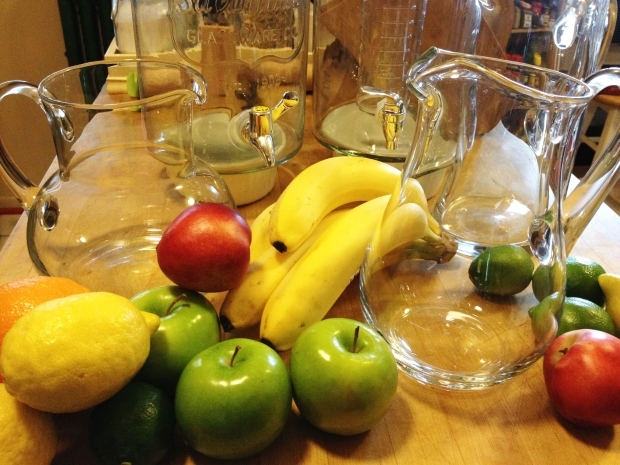 These three drinks use lots of fresh fruit and two start off with a batch of homemade infused simple syrups. They're all non-alcoholic. In a large saucepan, heat oil and butter over a medium heat. Add onions and sauté for 3 minutes. Lower heat, add mushrooms and sauté for an additional 15 minutes until mushrooms are tender and have released most of their moisture. Transfer mixture to a bowl and allow to cool. Put the pan back on the heat and add spinach. Stir until spinach is fully reduced, about 5 minutes. Transfer cooked spinach to a strainer and allow to cool. Place flank steak on a flat surface with the grain pointing towards you. With a sharp knife, carefully butterfly the steak by slicing through the middle of the steak parallel to the cutting surface (like slicing a bagel) until about an inch before reaching the end. Open the steak, creating a flat rectangular surface. Flatten the steak with a meat tenderizer, if you have one (or just use a soup can or other similar sized food can). Prepare your grill. Sprinkle half of the grilling spice mix on the surface of the steak. Top with breadcrumbs. Squeeze any excess moisture out of the spinach and layer it on top of the breadcrumbs. Distribute the mushroom mixture on top of the spinach, followed by the red peppers and parmesan cheese. Starting at one end, tightly roll the steak around the filing. Lay the roll seam side down. Using the butcher’s twine, create a loop around one end and tie it tightly. Repeat with the other end. Then, create about 4-5 additional loops along the length of the roll to secure it. Sprinkle remaining grilling spice mix on the outside surface of the beef roll. Sear the roll on the grill for about 2 minutes per side. Then, place the roll away from the coals (or direct heat) and close the grill. Cook for about 30-40 minutes or until the internal temperature of the roll reaches 130 degrees F for medium rare, or longer for your desired doneness. A quick read thermometer is a very useful tool to have for determining the internal temperature. 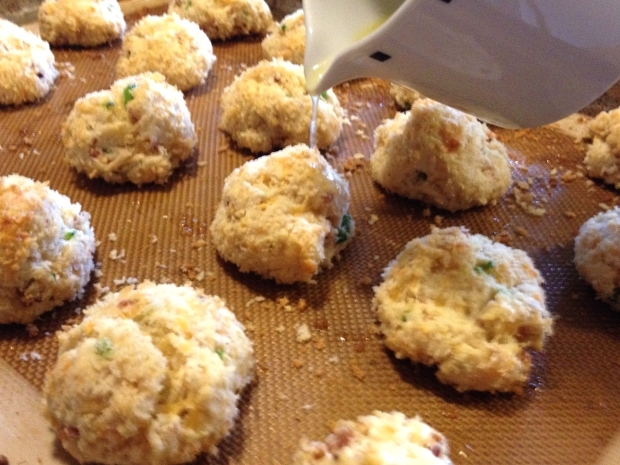 Wayne's Weekend: Mini Jalapeño, Bacaon and Cheddar Biscuits, part of a trio of tasty appetizers that are perfect for outdoor entertaining. Remove roll from heat and cover with aluminum foil for about 10-15 minutes. Then, carefully slice with a very sharp knife and serve. This dish is great with a simple salad or caprese salad. Mix ingredients together and either grind in spice grinder or in a mortar and pestle. Store in an airtight container.